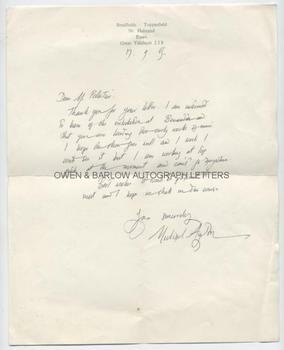 MICHAEL AYRTON autograph Letter Signed. British (English) artist, illustrator and writer. ALS. 1p. Bradfields, Toppesfield, Nr Halstead, Essex. 17th September 1965. To Mr Pettifar. "Thank you for your letter. I am interested to learn of the exhibition at Benenden and that you are lending two early works of mine. I hope the show goes well and I wish I could see it but I am working at top pitch at the moment and can't go anywhere. Best wishes. It would be pleasant to meet and I hope we shall in due course." 4to. Approx 10 x 8 inches. Slight edge crease. Fine. Michael Ayrton was, at the date of this letter, undergoing one of his most productive periods. In 1965 he produced several landscape paintings, portraits (including that of the novelist William Golding), the sculpture entitled 'The Maze Player', and was also involved in illustration, and work as a broadcaster, critic and writer. With John Minton, Michael Ayrton is regarded as one of the most important and influential British artists of his generation.